My bloggy friend, Ces, talks about launching her children into lives of their own, and that concept is the starting point for this week’s Illustration Friday submission. We have been on vacation for four days now, and I am keenly aware that our family is dwelling in a pocket of time that is truly unique and may very well be short-lived. Our kids are now 10 and 12, ages where they are easy to please and take care of (I’m remembering packing the car with huge canvas bags full of plastic gizmos and floaty toys, potty stops every 50 miles, and always providing a side dish of macaroni and cheese to whatever culinary concoction was being planned for vacation decadence) but yet they still like us and still want to be seen with us, have us chaperone school field trips, coach their teams and volunteer at school parties. We don’t know yet what parenting teenagers is like, but we’ve seen a few of them and we were once teenagers ourselves, so we have some idea. We may very well have to brace ourselves. We’re up for it, we’re paying attention and we are doing our best to provide a suitable and stable launch pad. In the meantime, the only launching I’m doing this week is out of my beach chair to jump waves with two certain boys who are really only mine for a little while longer. Update: Check this out, I’m infringing on my brother’s copyright here, but it is oh so cool, and also so appropriate for launch, I’ll make him a pie or a cheesecake or something later, and maybe he’ll forgive me. My brother is a real rocket scientist, and is currently in Baikonur doing his thing. Among other things, he posted this photograph of a Soyuz launch on our family blog. Hey Krista! Hope you are having a blessed vacation! Time is short. Cherish those times together. The launch is sooner than you think. I’ve launched five…. successfully :o) Kudos to your brother the rocket scientist! Sometimes it doesn’t take a rocket scientist… but it’s great to know one. What a lovely concept: launching your children into life. And I love the illustration. Lovely muted browns and beiges, just like the beach. Thanks for your thought-provoking post. It sounds like you are doing a wonderful job balancing home, family and art… so enjoy! Oh ces is so modest eh? Krista I really enjoyed this post. It’s wonderful that there are real people behind the art that we see here and I hope you are having a splendiferous holiday. I love the illustration, and your lovely sentiment. My youngest just graduated from college, and we loved having teenagers around the house…you will, too! What a lovely post about family! Enjoy the vacation. I am envious, since at the moment I am having a hard time convincing my teen that going on vacation with his dad and me would actually still be fun. It’s wonderful to live in the moment and appreciate what you’ve got. I hope you’re having/had an excellent vacation. 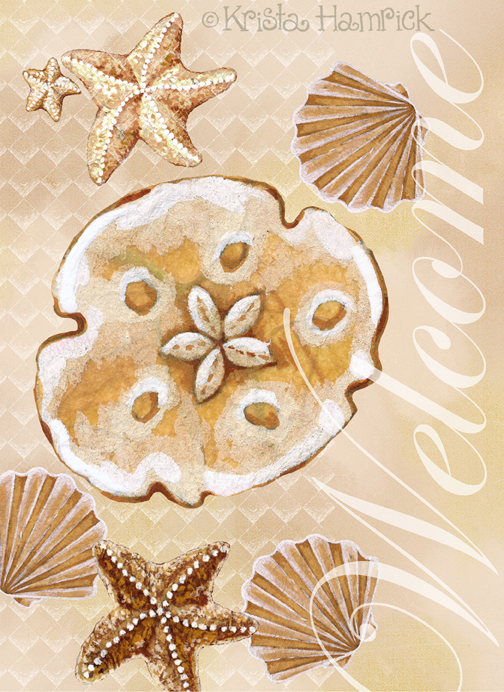 Lovely seashells and your brother’s pic is very cool too. What a beautiful illustration, and I love the soothing colors. I know just how you feel, my friend. My two girls are 9 and 12. They’ve reached their halflife with me, and they will be launched before I know it. Maybe I will be dragged along as I clutch on tightly to their tails. Enjoy your time at the beach. And your brother is so cooooool! Aaaaawwww!!! Thank you for the shout out. I am afraid I am not the best launcher. I am just grateful that we are alive and sane after the first run through the teenage years. With my son it was a ferris wheel of emotions. really, I am grateful that I can still say I love him very much and give him my liver if he needs it. Launching our children into their own lives is always easy. My parents had an okay time, I guess. My siblings and I (all 8 of us) cooperated and we begged to be launched from early on. My husband and I are still on the launch pad. Our son just turned 18. The irony of it all, my children are the ones teaching me how to be a parent. I never realized that the heart can stretch soooooooooo much. I thank my husband, my daughter and my son and those whose quite helping hands who propped me up whenever I fell or tripped and who glued my heart every time it cracked, my sisters and two of my closest, dearest darling sweetest sisterfriends. So cool that your brother is a real rocket scientist! How many people can say that?! Sweet post and a really cool pic from your brother. Wow, really a rocket scientist? That is so cool.